In June I had my right hip replaced. Twenty years of running eroded the cartilage in the joint and when the pain became intolerable I elected to go under the knife. Parish elders said, “You’re too young to have hip surgery.” (I’m 43.) In the words of Indiana Jones: “It’s not the years, it’s the mileage.” Recovery was slow and painful but by the third week I was able to celebrate Mass. But I couldn’t genuflect and I missed that because the genuflections of the priest are integral to the Mass. In my case a profound bow sufficed. Genuflection is one of many symbols of Catholicism. As Catholics we genuflect in Church in reverence for the true presence of Jesus Christ in the Eucharist. Genuflection is a sign of humility in imitation of our Lord, who humbled himself to follow God’s plan. When we enter God’s house we genuflect because we respect the glory of Christ who was lifted on high for our salvation. Adam strove to obtain the divinity of God and he fell. Jesus chose not to lord his divinity over humanity and for that he was glorified. For the Israelites the sight of the serpent on the pole was a symbol of healing and regeneration, a means to humble themselves before God. Were they to make it through their desert journey they needed to submit to the Lord. The primary symbol of Catholicism is the Cross, celebrated in a special way on the Feast of the Holy Cross, which this year falls on the 24th Sunday or Ordinary Time. 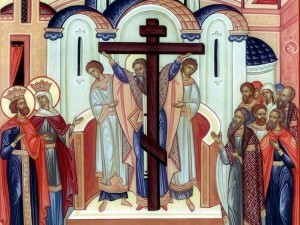 Public veneration of the Cross dates to the fourth century when Saint Helena, mother of the Emperor Constantine, discovered it in Jerusalem. The feast commemorates the rescue of the Cross from the Persians in the 7th Century. 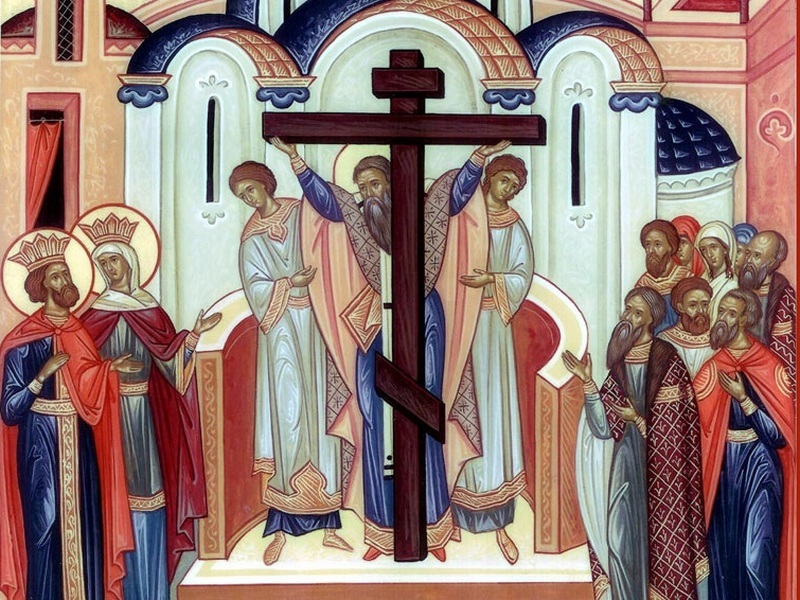 The Church celebrates the triumph of the Cross because it is the symbol of salvation, the sign of God’s saving power that helped the wilderness generation (Nm 21:4b-9). During the Mass the priest genuflects five times: at the entrance, twice during the consecration when the body and blood of Jesus are elevated, before he holds aloft both species and repeats the words of the Baptist, “Behold the Lamb of God,” and at the recession. Five genuflections represent the five wounds of Christ borne by the priest who acts in persona Christi. After my surgery several weeks passed before I was able to genuflect without my joint locking up. Still, I was reminded daily of the wounds of Christ. Isaiah, speaking on God’s behalf, said, “To me every knee shall bend, by me every tongue shall swear, saying ‘Only in the Lord are just deeds and power’.” Understanding Jesus’s crucifixion is essential to receiving the spiritual and physical healing he provides. All it takes is the humble gesture of bending the knee before the Lord our maker.